My furniture is aging fast and I need to replace it soon. 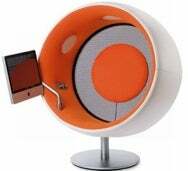 You know, it would make my buying decision so much easier if Apple just made their own line of furniture. Then again, there'd probably be some problems with that: like you wouldn't be able to buy any of it, because it would always be the first revision of a new form factor. While my search for a couch may continue, I've found what is clearly the right chair for my living room. Sure, it's a little funny looking. It doesn't match anything in my house. It doesn't even look that comfortable. It's absurdly expensive as well. But that's not important, and you know why? Because you can get one with an iMac built-in. That changes everything. Who needs to be practical when you get a Mac built into your furniture? Other than food and... at least one other task, there's no reason to ever get up. Now if you'll excuse me, I need to search for a toilet with a Mac attached to it.